Each purchase transaction will be governed by the provisions of Legislative Decree 185/99, Legislative Decree 206/05; the information directed at the conclusion of the contract will be submitted to the art. 12 of the Legislative Decree. 70/03 and, as regards the protection of confidentiality, will be subject to the legislation referred to in Legislative Decree. 196/03 and subsequent amendments of the law (privacy). These Terms and Conditions do not apply to the offer of those items for which particular conditions of sale are applicable, which will be indicated from time to time in the pages dedicated to the products themselves. Orders, conclusions of the contract and acceptance of the general conditions of sale. Before proceeding with the conclusion of a sales contract, it is necessary to register on the Website, entering the name, surname, e-mail address and password (hereinafter "registration credentials"). Registration on the site is free. Registration is confirmed by e-mail sent to the address provided by the user. The registration credentials must be used exclusively by the user and can not be transferred to third parties. The user will consider Bh Smoking Accessories to be free from any obligation to compensate, penalties arising and / or in any way related to the violation by the user of the rules on registration to the Site. The user is solely responsible for accessing the Site through the Registration Credentials and is directly responsible for any damage or injury caused to Bh Smokng Acessories or third parties by improper use, loss, misappropriation by others or by the failure to protect the proper secrecy of their Registration Credentials. All transactions carried out through the Registration Credentials are considered as carried out by the customer to whom the Credentials themselves refer. By completing the purchase you implicitly state that you have read the following warnings given here..
PayPal allows you to receive and make payments online without sharing your financial data. Registration for free. With PayPal you can pay for your purchases for free using your credit card (Visa, Visa Electron and MasterCard) or a prepaid card (Postepay, Kalibra and others) without to share data with the seller. You can also receive payments at competitive rates, from anywhere in the world and in different currencies, thus expanding your network of buyers. In addition, PayPal Buyer Protection offers a refund of up to EUR 1000 in the case of an item not received or not compliant with the description. 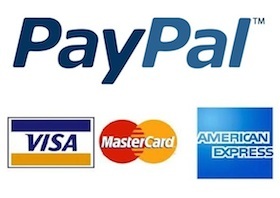 To pay with PayPal it is not necessary to have a PayPal account. For security reasons, sending payments via PayPal and transferring funds from your PayPal account to your current account are initially limited to EUR 750. These limits can be removed through the PayPal account verification process. The order will be delivered to the address indicated when ordering. 1. Shipping time (from 24 to 72 hours): verification of the reliability of the information provided at the time of the balance of the account + preparation of the order + management of the package (s) by the carrier. 2. the delivery time of the package by the carrier chosen by the Customers. The deadline for the delivery of the order will be communicated to the Customers on the website in the «summary of the order» page. In all circumstances, in the event that delivery exceeds 14 (14) days the expected delivery date, and not due to force majeure, Customers may cancel the order by registered letter with return receipt and will be reimbursed within a maximum of fourteen (14) days. 2 consecutive deliveries for each product. In case of double non-delivery (refused package, delivery impossible ...), the product will be left available to the customer at the courier gls for 10 days. Beyond this term, the material will be considered as abandoned. Bh smoking accessories can dispose of it in a full and absolute, and proceed to its destruction. In this case, no refund can be requested. -that the delivered products comply with the order, and to indicate, in case they are damaged, any anomalies on the delivery form in the form of handwritten and countersigned reserves. We ask our customers to note that, if there are suspicions of fraud related to a specific payment, the latter can be canceled without notice. Sales of products via the Internet are governed by Law Decree 206/2005 which regulates the subject of distance contracts, ie carried out outside business premises. This legislation establishes the right of withdrawal, or the possibility for the consumer to return the purchased product and to obtain reimbursement of the expenses incurred. This right is reserved exclusively for natural persons (consumers), so it can not be exercised by legal persons and by natural persons acting for purposes related to their professional activity. 1-Select the order from which you want to return an item by clicking on "Details". 2- Select the products you wish to return via the box next to the names. 3- Add the quantity to be returned (in case you need to return more than one product). 4- (optional) In the "Goods Return" section, add an explanation so that the team understands better why the customer wants to return that product. 5-Click on "Request a refund". The costs of resending the product are totally charged to the customer. damage to the product due to causes other than transport. The indicated duration of 14 days is counted from the date of delivery of the order. Bh smoking accessories will proceed to the transmission of the re-crediting order related to the cost of goods shipped within 14 working days after the shipment of the goods by the customer and in any case not before receiving the goods. The Bh smoking accessories will consequently reject any returned product not packed, as well as the products for which the return costs have not been fully paid by the Customer. Please note that the right of withdrawal is excluded, in this case, in the case of personalized items on request and in the case of objects in compliance with the order that have already been used by the customer. The shipping costs of the product are charged to customers. On the basis of the legal guarantee of conformity, La Bh smoking accessories undertakes to deliver an order in compliance with the contract of sale concluded and to respond for any conformity defects found at the time of delivery. 2) present the quality and usual performance of a product of the same type, which the consumer can reasonably expect, taking into account the nature of the ARTISAN product and the characteristics described on the Website. In the event of an established lack of conformity, it will be necessary to restore the conformity of the defective product, at no cost to the Customer. Please note that this legal guarantee covers any conformity defect manifested within the term of 2 years from the date of delivery of the order. - Any lack of conformity of which the customer was aware at the time of placing the order. Bh smoking accessories can not under any circumstances be held liable for delay or failure to deliver, and within the limits of the law the Bh smoking accessories will have the right to terminate all or part of the contract, suspend or delay its execution. Bh can not be held responsible for damages resulting from a misuse of the products sold on the Website. We wish to inform you that the personal data you provide or otherwise acquired within our activity may be processed by Bh smoking accessories on paper and / or with the aid of IT tools in compliance with the law for management purposes, sending documentation technical, statistical, commercial, marketing, promotional or commercial communications. is not absolutely responsible for their content, nor will it be able to use this information for purposes other than that indicated. The personal data supplied by you will be entered in a database and / or stored in paper files or on magnetic media and will be handled by us manually or through the use of electronic, telematic systems and any other means made available by the technical and from technological evolution in compliance with the law. The processing of data will be lawful and correct and, in any case, in order to guarantee the security and confidentiality of the data. in digital format, they will instead be stored separately and will be accessible only on your request and for maintenance / restoration purposes. Not being able to distinguish the data to which Bh smoking accessories. can potentially access, will be treated as sensitive data, and will therefore adopt the corresponding IT security measures to protect you. From your client account, a new card called My personal data is available and the customer can retrieve all the personal data collected from the store and the installed modules, in PDF or CSV format. With respect to the data in our possession, you are entitled to exercise all the rights recognized by art. 7 of Legislative Decree no. 196/2003 and subsequent amendments that for your convenience we reproduce in full: The interested party has the right to obtain confirmation of the existence or not of personal data concerning him, even if not yet registered, and their communication in intelligible form. The interested party has the right to obtain the indication: the origin of personal data; of the purposes and methods of processing; of the logic applied in case of treatment carried out with the aid of electronic instruments; of the identifying details of the holder, of the responsible and of the designated representative according to article 5, paragraph 2; of the subjects or categories of subjects to whom the personal data may be communicated or who can learn about them as appointed representative in the territory of the State, managers or agents. The interested party has the right to obtain: updating, rectification or, when interested, integration of data, deletion, the The interested party has the right to object, in whole or in part: for legitimate reasons, the processing of personal data concerning him, even if pertinent to the purpose of the collection; to the processing of personal data concerning him for the purpose of sending advertising or direct sales material or for carrying out market research or commercial communication.